Chalkwell are a highly experienced and professional coach operator providing coach travel for commuters, schools and personal excursions. Their existing website needed bringing up to date to provide visitors with greater information, a professional user experience and the opportunity to book and pay for various services online. Inspire developed a new website that offered visitors a simplified user experience incorporating one click navigation to the key service areas from the home page. Clients are now able to book and pay for commuter tickets and daybreaks online. The incorporation of a services status area and real time coach tracking means that commuters and school bus users are able to immediately identify any possible delays with their services. 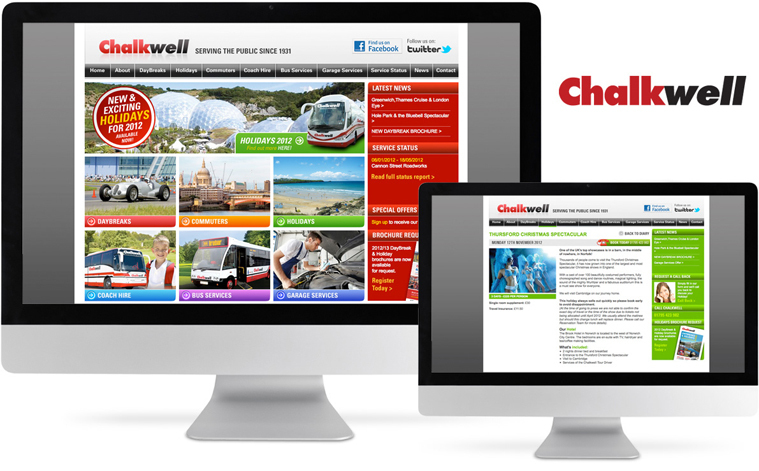 The implementation of the new site has not only increased the professionalism of Chalkwell’s online presence but customers have found it easier to access key information. The introduction of the online booking facility has streamlined the number of incoming calls.